An important element for the Discovery Service is the Conversion Wizard. It processes the discovered entries and then creates corresponding passwords and Password Resets. 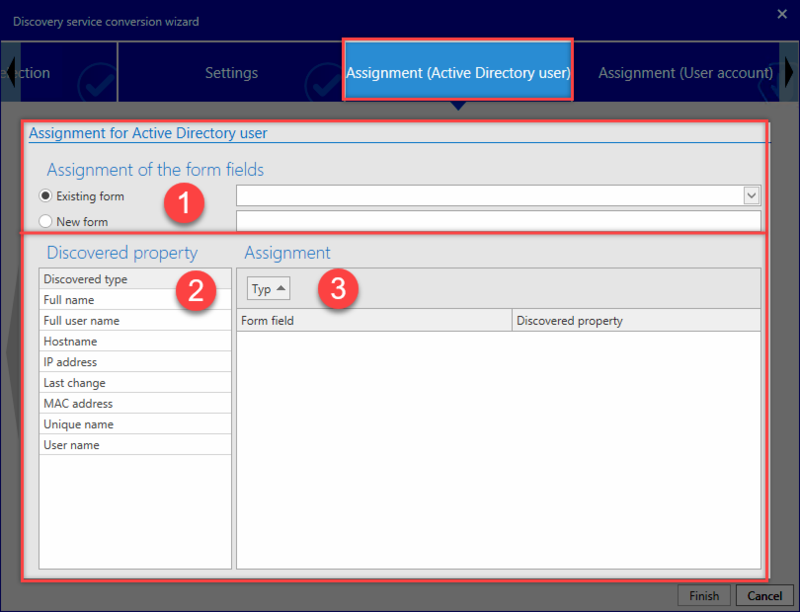 The Conversion Wizard is started in the Start ribbon and it is also possible to switch here to the System Tasks. After the Discovery Service Task has been successfully executed, the entries are available in the Discovery Service. Further processing of the entries is then carried out using the Conversion Wizard. *Only those services are recorded to which at least one AD user or user account can be assigned! Only AD users and user accounts to which at least one service can be assigned are recorded. In the Discovery Service table, the user selects the entries for which he wants to add a Password Reset or password. The user then clicks on the Conversion Wizard and the Discovery Service Cinversion Wizard opens for further editing. A Discovery Service Task first needs to be selected. This determines the context in which the new data will be created (for a new Password Reset, the password for the domain administrator for the task will be used as the executing user. 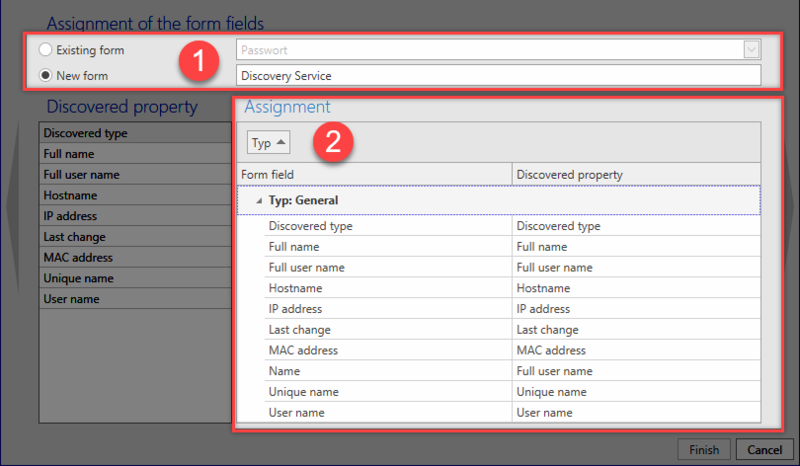 In addition, only those Discovery Service Task entries that are also discovered by the entered Discovery Service Task will be used for the conversion). 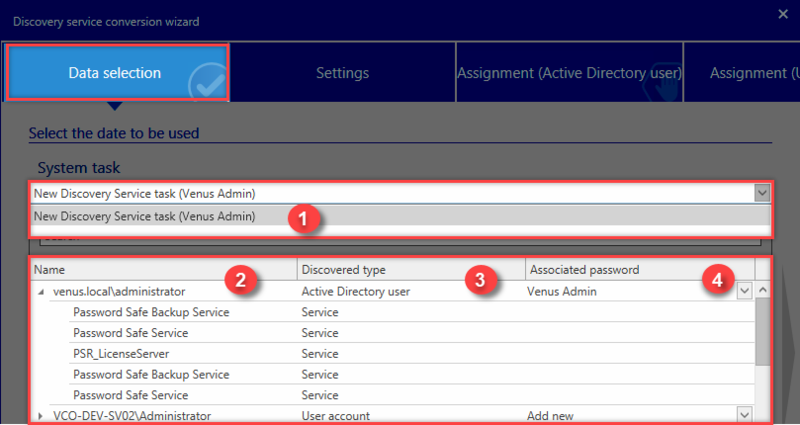 The discovered entries will be displayed in this column with the services for which the user has been entered. This column shows the discovered type for the entry. This column shows already existing passwords in Password Safe that match the discovered Active Directory user or user account. It is possible to select here which password can be used when creating a Password Reset (it is then used as the only password linked to the Password Reset). Alternatively, these passwords can also be newly created. *Logically, every root node corresponds to one user and all of its associated data (e.g. services). A Password Reset is created later for every user and its associated data. The following image shows the options add new password or retain existing password. In addition, the organisational unit in which the existing password is located is displayed. The Password Reset is configured in the Settings Ribbon. The organisational unit in which the Password Reset should be created is entered here. In addition, a template for the rights inheritance can be entered here. The responsible user for the password is entered here. A special tag can be set here. Option 1: Do you also want to add a Password Reset? Adds a* Password Reset* If option 1 is not selected, the following options are not displayed. Option 2: (Execute Password Resets immediately after they are created) means that the Password Reset will be executed as soon as you click on Finish. The responsible user for the Password Reset is entered here. Various triggers for the Password Reset can be selected here. !After clicking on Finish, the Password Resets will be immediately executed and the passwords changed!. This also applies to Windows passwords! If option 1: Do you also want to add a Password Reset? is not selected, *steps 4, 5 and 6 are not displayed for configuration. !After clicking on Finish, one or more passwords will be created but no corresponding Password Resets will be created! 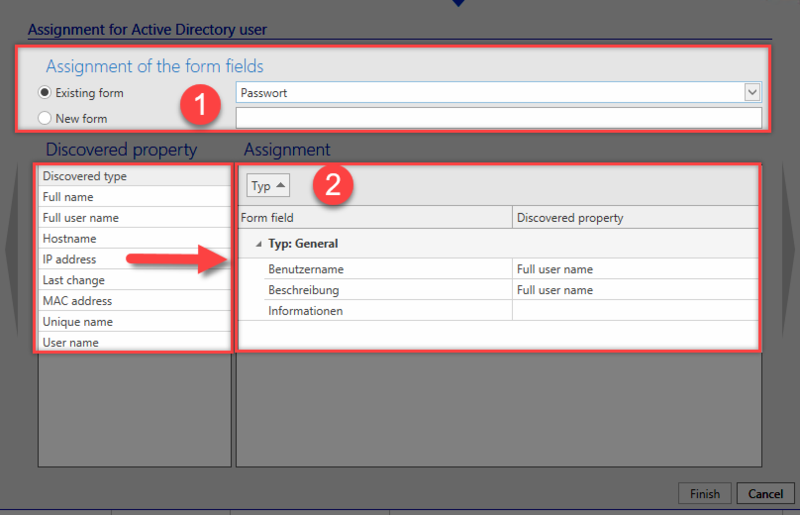 In the Assignment (Active Directory user) Ribbon, the discovered data for the Discovery Service entries is transferred to a password form. A brief overview of the actions that will be carried out with the added configuration is displayed in the Summary Ribbon. These actions will then be carried out if you click on Finish. An important aspect of Password Safe V8 is the security of passwords on systems. 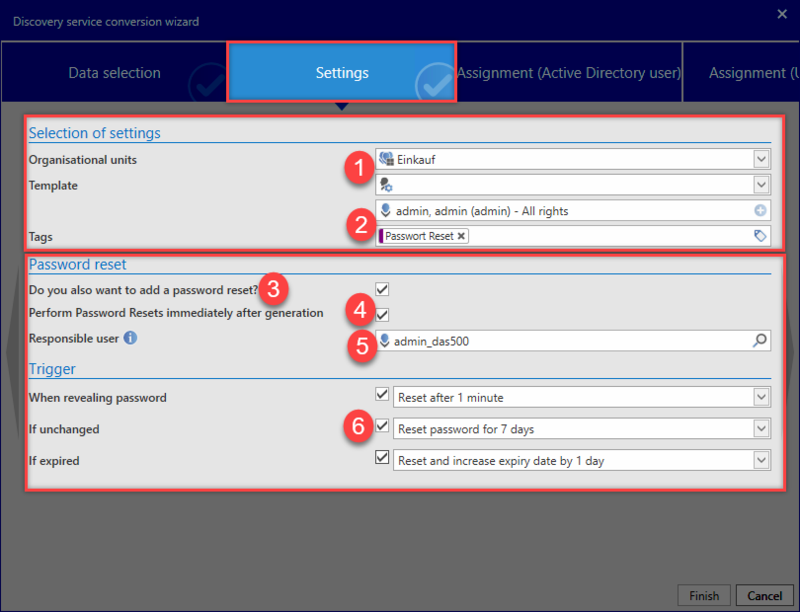 In the Discovery Service, a security measures is thus triggered at the last step for creating Password Resets. 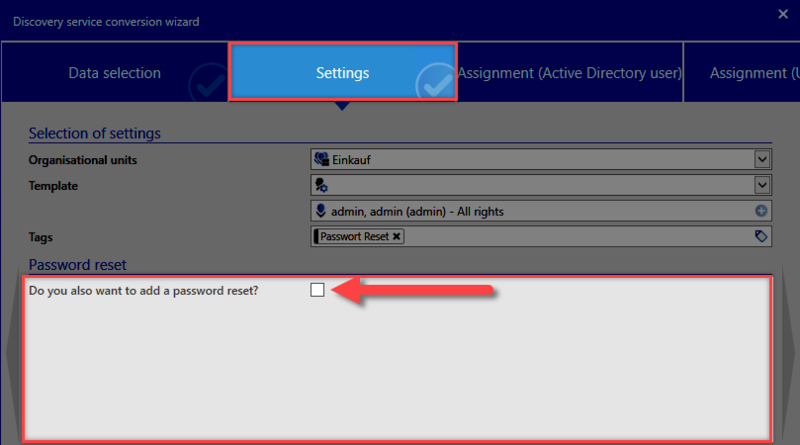 If the option Execute Password Resets immediately after they are created is used in the configuration, the selected passwords are immediately changed after clicking on Finish. If you are *not paying careful attention, this could have inconvenient consequences. An Important note is displayed in the Summary after clicking on Finish. !Please observe the note and read it through carefully! An Overview of which actions will be carried out is displayed for the user together with this note. The user can then still decide to Cancel the process. If you click on OK, an additional confirmation warning will be displayed. Another confirmation prompt highlights that it is important to understand what you are about to do. It will no longer be possible to reverse the actions afterwards! !Last chance to cancel the execution! After entering the displayed number and confirming with OK, the process is executed immediately and the Password Resets are carried out and the associated passwords changed.